Artillery Tools has been working with the restoration industry for over 6 years. We are the only demolition hand tool manufacturer that is doing the restoration industry trade shows. 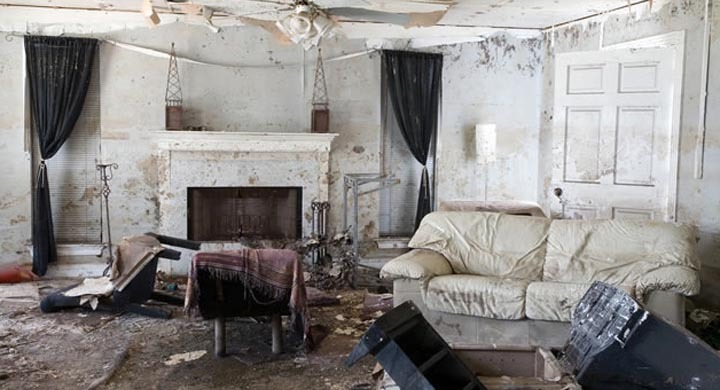 We have helped over 500 restoration companies and we have worked hard to solve the specific tear out needs of the restoration industry. 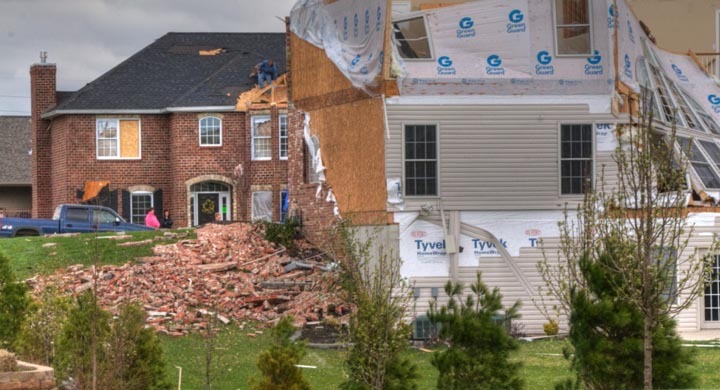 When disasters do strike, the type of damage and the severity often varies. This makes the Artillery Pry Bar System perfectly suited and a very valuable asset in the clean up process. Make short work of the demolition portion of your disaster restoration project with our Disaster Restoration Set! The Disaster Restoration Set was put together 5 years ago right after I returned from my first restoration convention. It supplies over 60 different tool configurations and allows three different bars to be used on the job site at the same time. Our new Disaster Restoration (DR) Set contains the perfect tools to remove materials related to water, wind and fire/smoke damage. Parts include Standard Fulcrum, Salvage Blade, 12″ Extension Handle, 25″ Steel Handle, Ball Grip, Fulcrum Extensions and the Left Toe Kick. The Ultimate Flooring Bar also works well removing roofing removal, because the length, weight and blade shape can easily be adapted for different roofing materials. This bar combines all the right pieces to create the most effective, comfortable and versatile bar for general flooring material removal including nailed or stapled wood flooring, chipboard or particleboard underlayment, Plywood or tongue-in-grove subfloors and linoleum and tile. This Ultimate Flooring Bar works well with any of our toolsets to create several bar combinations and multiple bars at the same time. The Sheetrock Lathe & Plaster Bar is excellent for water soaked sheetrock. This light-weight bar configuration integrates a strategic operating angle with custom blade design. The Decking Fulcrum provides an effective working angle and superior prying motion which allows you to start at the ceiling and to work your way down the walls towards the floor. The Deck Blade straddles the 2x4s making it easy to remove materials of any kind from the studs. The light-weight, 25-inch Fiberglass Handle is recommended to reduce fatigue while removing any materials that requires you to raise your arms for any length of time. The DR Set provides several other configurations that could be used to remove materials from walls and ceilings as needed. 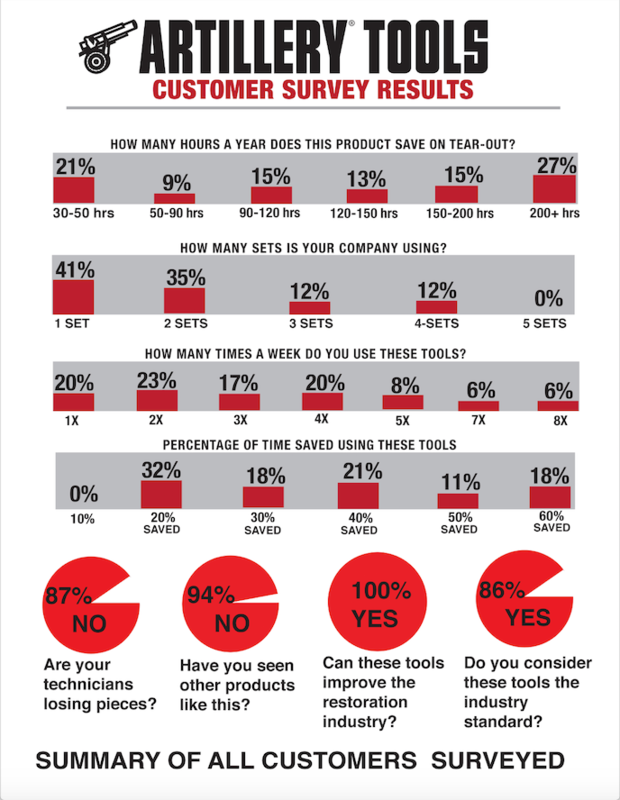 ARTILLERY TOOLS surveyed those customers who returned to our trade show booth over the years to find out what is new. Here are the survey results.